Carsharing.US: Good Bye Flexcar Portland. Hello Zipster! Good Bye Flexcar Portland. Hello Zipster! The weekend of January 26-27 marked the end of another era in the history of carsharing with rebranding of cars in Portland from Flexcar to Zipcar. The rebanding will be complete in all Flexcar markets within another month. The conversion of over 200 vehicles in only a few days was as well-orchestrated and well-staffed as anything I've ever seen. Cars continued to be available for use in each neighborhood throughout the conversion. The clever web technology folks even figured out how to automatically transfer a web reservation for a vehicle that had the Zipcar electronics in it from the Flexcar reservation page over to the Zipcar reservation page already logged in! 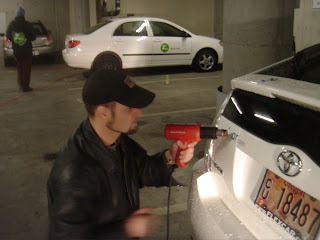 Teams worked 12+ hour days shuttling cars, removing the old decals, applying the new ones, changing out electronics and replacing the myriad of Flexcar instructions and information in each car. Peoples' spirits seemed good even as the days wore on. Those in Portland hoping for a BMW or Volvo or a few more Minis are apparently going to have to wait a while longer. Zipcar is approaching the conversion of Flexcar very cautiously and not making promises of any new vehicles for a while. So for now, Zipcar Portland members will have to content themselves with the existing fleet of Honda Civics, Civic Hybrids, Honda Elements and Odyssey vans, Scions of various flavors, Subaru Imprezas, Toyota Tacoma pickup, as well as the Portland signature Mazda Miata convertible. 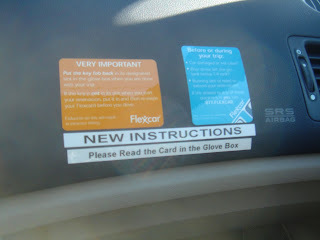 Flexcar members probably won't miss the confusing array of warning stickers on the dashboard, gas card instructions, accident reports, maps and how to information randomly placed in side pockets, glove compartments and the infamous visor organizers. Two things from the Flexcar days I'll miss: 1) the little used but very handy touch tone telephone reservation option and 2) the very clever $9.99 per month experimental Auto Advantage rate plan. The plan included 3 hours of usage (use it or lose it) and additional hours were at the regular price. Why you might ask would the carsharing company do this? To me, the beauty of this plan is (was): a) you're getting a little revenue out of the customer every month, whether they use any vehicles or not (so it functions sort of like a monthly membership fee) but it's not so high that most people would lose too much sleep over paying it if they didn't use a car + when the member does drive the trip is likely to be more than the 3 hours that's included, so, voila, net revenue. The weekend also featured a visit to Portland from Swiss carsharing founder Conrad Wagner, on his almost-annual holiday west coast road trip. So it was an occasion for a party to introduce Conrad to Zipcar staff (here for conversion), Flexcar staff (past and present) and former CarSharing Portland GM, Russell Martin (whose roots go back even further to the San Francisco STAR program many years earlier). So now, on the eve of the 10th anniversary of carsharing in the US, I have witnessed two changes: from CarSharing Portland to Flexcar and now to Zipcar. Thanks Zipcar Portland staff for your hard work.